If you are thinking of traveling to Morocco probably be interested to read these tips. Morocco offers the visitor a destination that combines as few mountain, desert, coast, customs and ancestral tribes, cities steeped in history, only 14 km and connected with the main European airports is the door to a continent that Morocco is one of its best exponents, a country that has much to offer, if you browse these pages and those of our friends in Amazigh Aventura, who will tell everything you need to travel on the High Atlas mountains and desert. 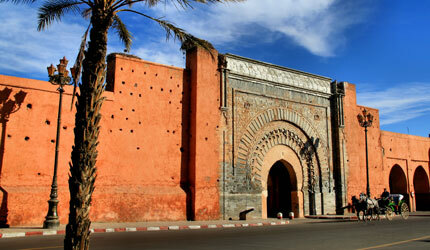 In the plains and Marrakech the temperature is mild almost throughout the year. Another thing is the summer where temperatures can easily reach 45º and 28º not lose hours. The coast in summer offers a pleasant climate even chilly night In the desert, during the day, much hot in summer ( summer too) instead nights are cold and very cold in winter. The procedures are not complicated but there are a number of details to consider in terms of do enter by boat or by plane or car. In any case always have to fill in a form of control. In three languages ​​and easily find and view ( at the crossing of Ceuta, we will on both sides who will offer to fill it , leave it to your discretion , but I we can confirm from experience that does not involve either improve or harm for us). Whenever we carry over 100,000 Dirham (9,000 €) are obliged to declare at customs, the same happens to the output Bring a pen save us some time. We will present our passport with this form that will stay in customs control Generally all Europeans have authorized stay in the country up to three months without a visa. The driving their own vehicle will have to fill in the office and take rule Green Card (Secure). Deliver with our passport documentation and we will issue a document to be riding in the vehicle and can be requested at any time, it is important not to lose because we at the outlet re-delivery to terminate the vehicle. At border crossings is more than likely that we inspect the vehicle thoroughly in some cases, Morocco allows entry of alcohol and snuff for personal use. In Morocco you can haggle and negotiate the price almost anywhere. Not only not offend them, but they’ll like decorating business with this little struggle. The official currency is the dirham. € 1 is exchanged for 11 dirhams. We recommend you to always carry small coins for lower expenses.